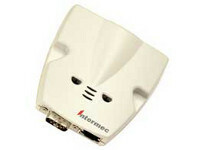 The Intermec MicroBarTM 9730 is a universal solution for connecting data capture devices. Use the Intermec 9730 to decode the output of a simple bar code wand or as a platform for advanced applications. The Intermec 9730 can connect multiple ADC inputs to PCs or terminals via their keyboards or RS-232 ports. The Intermec MicroBar 9730 is suitable for connecting bar code wands and scanners to PCs in a wide range of applications for homes, offices, libraries, healthcare and industry, and for connecting multiple input devices to a single terminal in retail. The Intermec 9730 is also an application platform that provides extremely powerful data formatting capabilities. Format according to type of symbology, bar code length, data structure and input port. Utilize maximum numbers of characters to apply the full power of the bar code system to specific applications in your business.